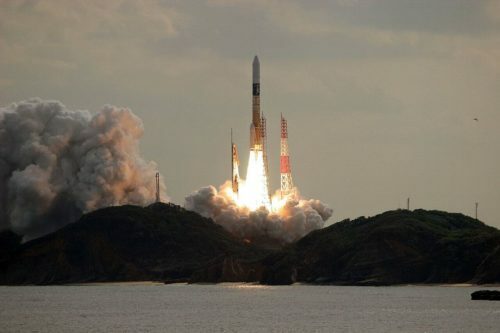 In December, 2014, Japan launched a rocket to send its spacecraft, Hayabusa2, into space. The Hayabusa2 has finally arrived near the asteroid it was sent to study. It traveled about 2 billion miles (3.2 billion kilometers) over 3.5 years to get there. 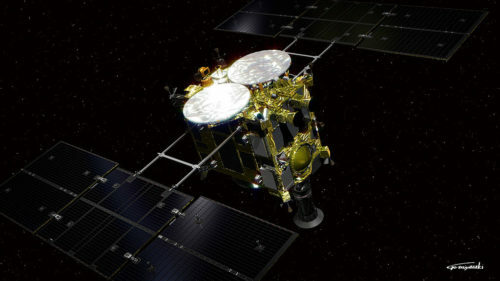 Hayabusa2 was sent into space in December of 2014. It took 3.5 years to reach the asteroid Ryugu. Asteroids are big rock-like chunks that are floating in space. Billions of years ago they were just dust and gas near the sun. Other bits of dust and gas grouped together into planets like Earth. Although asteroids can be large, they are tiny compared with planets. This picture shows that asteroids can be very different sizes. 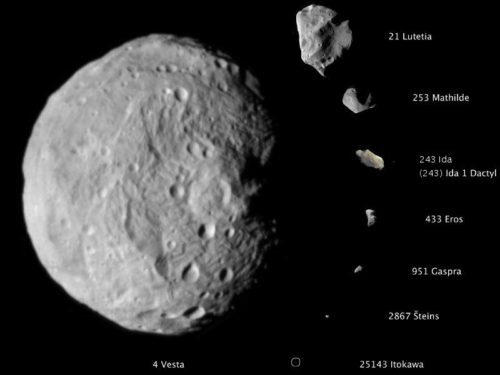 4 Vesta is the largest one shown here. It is 326 miles (525 kilometres) across. Scientists think that by studying asteroids, we may be able to learn more about how the planets were made and how life started. Scientists also think that asteroids may contain special metals or other things that might be useful on Earth. 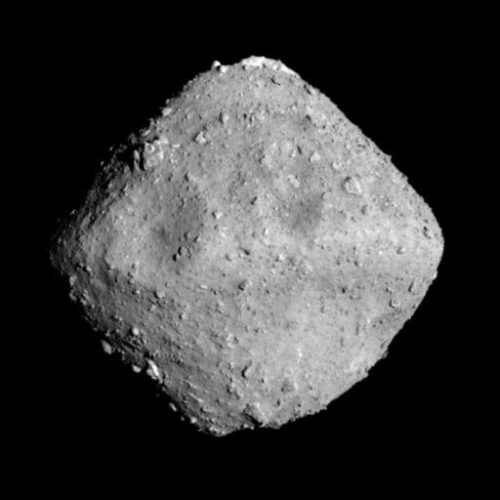 Ryugu, the asteroid that Japan is trying to study, is about half a mile (880 meters) wide. Right now it is about 170 million miles (280 million kilometers) away from Earth. From far away, Ryugu looked round. But when the Hayabusa2 got closer, scientists could see that its shape was more like a bead in the form of a diamond. Now that Hayabusa2 is closer, scientist can see the shape of Ryugu more clearly. Ryugu is very dark – about the color of coal. Scientists say it has a lot of carbon in it. Scientists think that asteroids like Ryugu might have played a part in helping life on Earth get started. Carbon is important for most life as we know it. Scientists say the asteroid might also contain water, something else that is important for living things. The goal of the Hayabusa2 is to take back samples of the asteroid to Earth. The Hayabusa2 will spend about a year and a half near Ryugu. Some smaller spacecraft will be sent down to try and collect pieces of the asteroid. They won’t be able to stay long, because the asteroid is so hot. Japanese spacecraft Hayabusa2 will study Ryugu for a year and a half. Japan also plans to shoot a big, heavy copper bullet at Ryugu. They want to make a hole so that they can collect pieces from inside the asteroid, too. The scientists chose the metal copper for their bullet because they are sure there is no copper on Ryugu. They don’t want to get confused about what the asteroid is made of. This is the second time that Japan has tried to collect samples from an asteroid. The first Hayabusa spacecraft brought tiny bits of an asteroid back to Earth in 2010, but it had many problems along the way. Japan has tried to learn from those problems with the Hayabusa2. 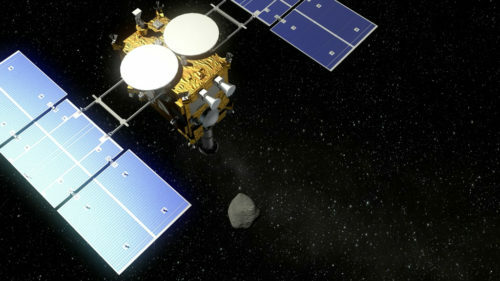 This is an artist’s idea of what the Hayabusa2 might look like as it came close to the asteroid. This picture was made before Hayabusa2 left the Earth. The US space group NASA has also sent a spacecraft to an asteroid. A spacecraft called Osiris-Rex should reach an asteroid called Bennu in August. The Osiris-Rex will also collect bits of the asteroid. 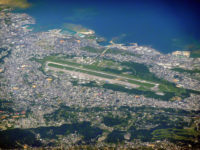 The US and Japan have plans to share their samples and other results with each other. Scientists will have to wait a long time to actually see the samples, though. The Hayabusa2 will return in 2020, and the Osiris-Rex won’t come back until 2023.